in P.M. I was in at Mrs Howe's & in to Rose's of errand A.M. April 22 Tuesday Another beautiful morning. but the wind rose, blowing very strong from South E & Mer stood 80° + at noon, & little above most of P.M. All well Ellery cleaned out kitchen chimney, & with Lena's help took down & cleaned stove pipe. 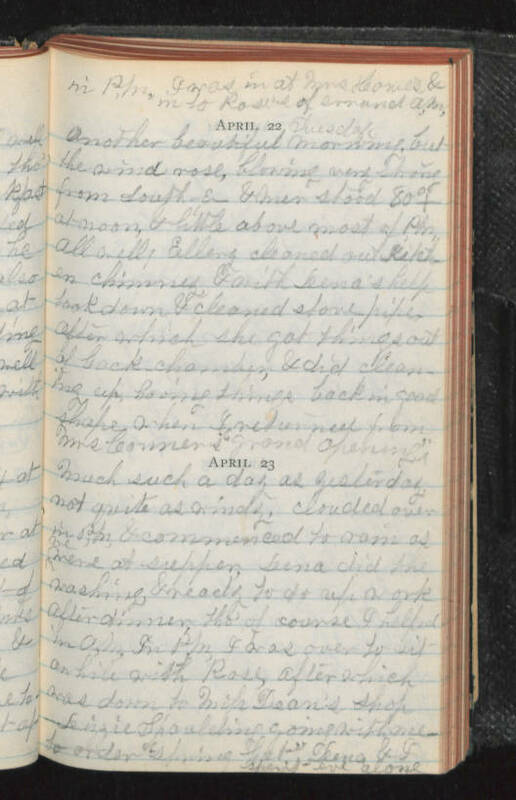 After which she got things out of back chamber, & did cleaning up, having things back in good shape when I returned from Mrs Comer's "grand opening" April 23 Much such a day as yesterday not quite as windy, clouded over in P.M. & commenced to rain as we were at supper. Lena did the washing, & ready to do up work after dinner, tho of course I helped in A.M. In P.M., I was over to sit awhile with Rose, after which was down to Miss Dean's shop. Lizzie Spaulding coming with me to order "spring hat" Lena and I spent eve alone.